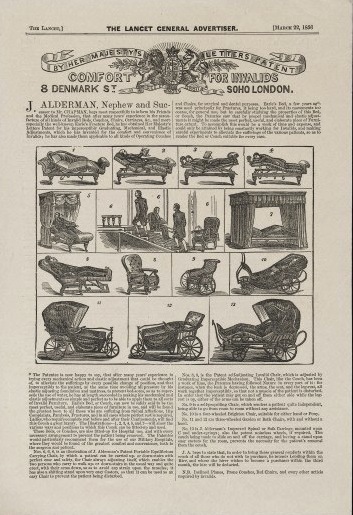 In 12 sketches, this advertisement showcases how the invalid chair can be reclined in various poses, used in the bedroom, outdoors, and even up staircases. "Comfort for Invalids" from the Lancet General Advertiser. Courtesy of the Wellcome Institute for the History of Medicine under a Creative Commons License (Call no EPH448:7). In this advertisement for a variety of what we would now call “wheelchairs” or “lounge chairs,” J. Alderman offers “comfort for invalids” in his newly patented “Imperceptibly Graduating, Mechanical, and Elastic Adjustments” available in a variety of couches and chairs. Credit for the “first wheelchair” most often goes to John Dawson of Bath, a town that attracted many invalids seeking its healing waters in the late eighteenth and nineteenth centuries. Around 1798, Dawson called himself a “Wheel-chair maker” and hired out his chairs to the invalids who flocked to the spa town. These "Bath Chairs" typically had two large wheels in the back and a smaller wheel on the front; they were pushed by an attendant, but directed by the passenger by means of a rod attached to the front wheel. Yet, as Herman L. Kamenetz points out, there was a long global history of carrying invalids in litters, pushing them in wheelbarrows, or later, carrying them in sedan chairs. (Sedan chairs were also used by the upper classes.) Furthermore, wheeled chairs certainly existed before the late eighteenth century. Louis XIV, for example, was one of many historical figures who had a wheeled chair (his was known as the roulette) to accommodate immobilizing health issues such as gout. It would thus be oversimplifying to give the credit of “inventing” the wheelchair to Dawson alone. Yet, as Alderman’s advertisement demonstrates, there was certainly a thriving industry catering to the many self-professed invalids of the nineteenth century (who included figures such as Florence Nightingale and Elizabeth Barrett Browning). Alderman’s couches and chairs are above all a product, to be sold or hired to some of the same invalids who spent winters in San Remo due to diseases of the chest, or who sought cures at expensive hydrotherapy establishments such as Ben Rhydding. One important difference between the chairs and couches that Alderman advertises and the contemporary wheelchair is that most of Alderman’s products are either stationary, reclining chairs, or would require an attendant to push them. No. 9 alone is self-propelling. By contrast, contemporary wheelchairs are assumed to be self-propelling using either a motor or the user’s two arms. Alderman’s products thus highlight interdependence rather than independence, and the places to be found for invalids within the home. Another possible reading of Alderman’s many stationary chairs is that comfortable reclining chairs were no longer the province of invalids alone by the twentieth century; indeed, one can still buy “Earl” or “Earle” lounge chairs or chaises today, whose name may well come from Alderman’s patent. The Lancet,] THE LANCET CENTRAL ADVERTISER. [March 22, 1856. 8 Denmark St. Soho London. J. ALDERMAN, Nephew and Successor to Mr. CHAPMAN, begs most respectfully to inform his Friends and the Medical Profession, that after many years’ experience in the manufacture of all kinds of Invalid Beds, Couches, Chairs, Carriages, &c., and more especially the well-known Earle’s Fracture Bed, he has obtained Her Majesty’s Letters Patent for his imperceptibly Graduating, Mechanical, and Elastic Adjustments, which he has invented for the comfort and convenience of Invalids; he has also made them applicable to all kinds of Operating Couches and Chairs, for surgical and dental purposes. Earle’s Bed, a few years ago, was used principally for Fractures, it being too hard, and its movements too coarse, for general use; but by carefully studying the properties of this Bed, or Couch, the Patentee saw hat by proper mechanical and elastic adjustments it might be made the most perfect, useful, and elaborate piece of Furniture extant. To accomplish this would be a work of time and expense, and could only be attained by being constantly working for Invalids, and making careful experiments to alleviate the sufferings of various patients, so as to render the Bed or Couch suitable for every case. The Pantentee is now happy to say, that after many years’ experience in trying every mechanical action and elastic adjustment that could be thought of, to alleviate the sufferings by every possible change of position, and that imperceptibly to the patient, at the same time avoiding all pressure by his elastic adjusting foundation and mattress, to prevent bed-sores, so as to supersede the use of water, he has at length succeeded in making his mechanical and elastic adjustments so simple and perfect as to be able to apply them to all sorts of Invalid Furniture. Earle’s Bed, or Couch, can now be safely said to be the most perfect, useful, and elaborate piece of furniture in use, and will be found the greatest boon to all those who are suffering from Spinal Affections [sic], Hip Complaints, Paralysis, Fractures, and in all cases where perfect rest is required. Ladies, who require complete rest before and after their Confinements, will find this Couch a great luxury. The Illustrations—1, 2, 3, 4, 5, and 7—will show the various ways and positions in which this Couch can be fitted-up and used. These Beds, or Couches, are also fitted-up for Hospital use, and with every necessary arrangement to prevent the patient being removed. The Patentee would particularly recommend them for the use of our Military Hospitals, where they would be found of the greatest comfort and convenience, both to the surgeon and patient. Nos. 6, 6, 6, is an illustration of J. Alderman’s Patent Portable Equilibrium Carrying Chair, by which a patient can be carried up- or down-stairs with perfect ease and safety, the Chair always adjusting itself, which enables the two persons who carry to walk up- or down-stairs in the usual way and quite erect, with their arms down, so as to avoid any strain upon the muscles; it has also a shifting stand upon very easy Castors, so that it can be used as an easy Chair to prevent the patient being disturbed. Nos. 8, 8, is the Patent self-adjusting Invalid Chair, which is adjusted by Graduating Imperceptible Mechanism. This Chair, like the Couch, has been a work of time, the Patentee having followed Nature in every part of it: for instance, when the back is depressed, the arms, the seat, and the leg-rest all work together imperceptibly, so that not a muscle of the patient is disturbed. In order that the patient may get on and off from either side while the leg-rest is up, either of the arms can be taken off. No. 9 is a self-propelling Chair, which renders a patient quite independent, being able to go from room to room without any assistance. No. 10 is a four-wheeled Brighton chair, suitable for either hand or Pony. No. 11 and 12 are three-wheeled Garden or Bath Chairs, with and without a hood. No. 12 is J. Alderman’s Improved Spinal or Sofa Carriage, mounted upon C and under-springs; also the patent noiseless wheels, if required. The couch being made to slide on and off the carriage, and having a stand upon easy castors for the room, prevents the necessity for the patient’s removal from the couch. J.A. begs to state that, in order to bring these general comforts within the reach of all those who do not wish to purchase, he intends Lending them on Hire, and where the hirer wishes to become a purchaser within the third month, the hire will be deducted. N.B. Inclined Planes, Prone Couches, Bed Chairs, and every other article required by Invalids. London surgeon Henry Earle (1789–1838) invented this bed for leg fractures. A letters patent is an open document from a monarch (in this case Queen Victoria) or a government issuing a patent or right. Military Hospitals: Alderman is trying to appeal to the great number of disabled soldiers who were coming out of the Crimean war, which was in full force when this advertisement was published on 22 March 1856. "Comfort for Invalids." The Lancet (22 March 1856): 330. Kamenetz, Herman L. “A Brief History of the Wheelchair.” Journal of the History of Medicine and Allied Sciences 24.2 (1969): 205-210. Frawley, Maria. Invalidism and Identity in Nineteenth-Century Britain. Chicago: University of Chicago Press, 2004. “Wheelchair” and “Litter” on Wikipedia.org. Alderman, J., “Comfort for Invalids,” Nineteenth-Century Disability: Cultures & Contexts, accessed April 23, 2019, http://nineteenthcenturydisability.org/items/show/17.